Thanks to Bloggers Required I was able to connect with Rose to try Liquid Chalkers. I have never used ‘liquid’ chalk before so I had no idea what to expect. I like that I can go into a review so open-minded. I see chalkboard art all over Instagram and Pinterest these days and I love every bit of it. It reminds me of the South and being with my family. I am glad I didn’t have to tell the Rose that I was crafty because I am NOT. Melissa and crafty in the same sentence is pretty damn funny. 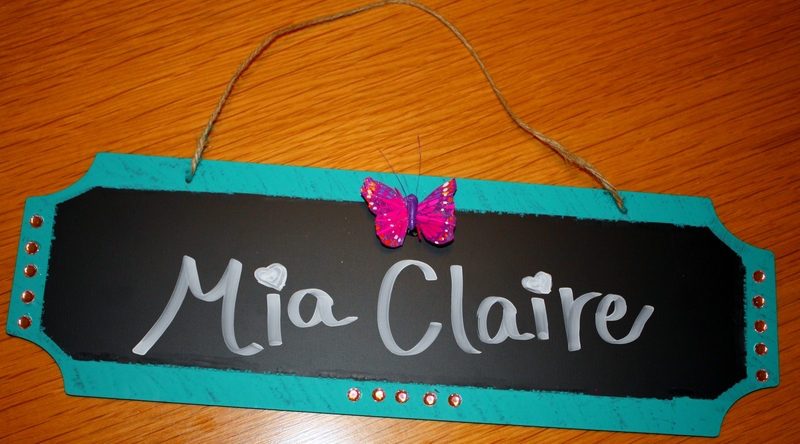 I had many ideas of what I wanted to do and finally decided to create a chalkboard sign with my upcoming granddaughter’s name. There are many different chalk pieces to choose from and I settled on one that was about 14 inches long because I didn’t want it to be too small. 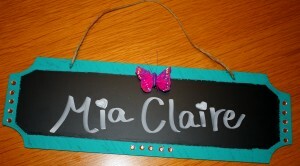 This DIY chalk sign is easy to complete! Anything else you want to add like ribbon, glitter, etc. Tape off the area to be painted. This is the one thing that I do well because I am so picky about lines and things being straight. Paint the taped off area to your liking. I started out doing long brush strokes but decided I didn’t like it. I ended up blotting the paint and I really like the result. You may need two to three coats depending on what color you choose. This will need to dry for at least one hour. Other paints could take longer, so adjust as necessary. After the paint is completely dry remove the tape slowly to reveal your marvelous work! Layout the extras you choose for the sign. In this case I chose some pink gems and a paper butterfly. I put them exactly where I wanted them so I could see how it would look prior to gluing. Glue your extras in place making sure not to use too much glue. It is HELL to get off and you could end up scratching the paint off when you try to remove it. I had to use my daughter to write on the board because my handwriting is atrocious. She made it look very pretty! I tested the Paper and Twine Liquid Chalkers on some mini chalkboards left over from my daughter’s gender reveal party. These were porous and had a cardboard backing. Big mistake! Well guess what! There is a warning on the package that tells you NOT to do that. I would recommend testing on the surface you intend to use. If you end up putting the Liquid Chalkers on a non-porous service you WILL know because it won’t come off. The lines of the Liquid Chalkers compared to a regular piece of chalk are drastic. The line of traditional chalk is think and faint. Liquid Chalkers lines are strong and solid. They have a thin and wide tip for you to decide what works best for your project. The liquid dries quickly and looks amazing on a chalkboard surface. I can’t wait to get my hands on the colored Liquid Chalkers! Thank you Blogger Required for connecting me with Paper and Twine for this review. Thank you Rose from Paper and Twine for your trust in my review. *I was not paid for this review. These opinions are 100% mine. Liquid Chalkers provided one set of white liquid chalkers for my review. I had never heard of liquid chalkers before–you know, I have a huge chalk sign in our living room that Adam and I use for countdowns until fun events we have planned, so I will have to try these out next time I need to invest in more chalks! Cathy, you will love these! Just make sure your board is not backed by porous material. Thank you Lisa. I will definitely check your blog out. I am very curious now! Thank you Danielle. Thankfully it was pretty easy! What a great idea for your first DIY chalk project. These are some easy steps to follow. I am going to head over to liquid chalkers and check them out. Thanks for sharing. Thank you Nate! I had to make it easy because I am not crafty! 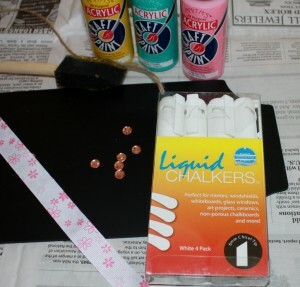 I’ve never heard of liquid chalkers before but it looks like a great project to do with kids. Love the final result. Salma, thank you for stopping by! I had not heard of them before but I found they also offer colored ones too! The kids would have a blast with those! thank you for stopping by Keyur.